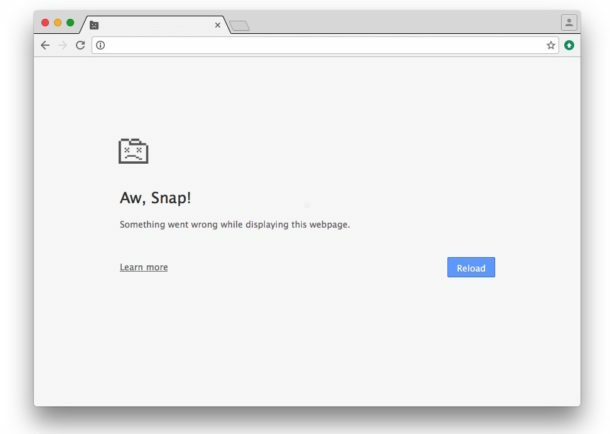 For Google Chrome users, sometimes a webpage may crash with an “Aw, Snap!” error message. This error message frequently prevents a web page from loading at all, and it can certainly disrupt a web browsing session by the page crashing. The “Aw Snap” error message in Chrome happens for a variety of reasons, but rather than try to diagnose and troubleshoot a specific issue which is likely related to the webpage itself, we’ll focus on 8 specific troubleshooting tips to fix the “Aw Snap” problem so that you can go about your business and keep browsing the web with Chrome. These troubleshooting steps apply to every version of Chrome browser on any operating system, whether it’s Mac OS, iOS, Android, or Windows. As you may have noticed when the “Aw Snap” error appears, there is a big “Reload” button next to it. That’s the first trick you should try. Simply reloading the web page often gets rid of the Aw Snap error and lets you continue onwards with browsing. This is actually one of the first pieces of advice suggested by Google to remedy the issue too. Incognito Mode prevents browser history, caches, and cookies from loading, and sometimes old web data can be the reason something is crashing. If the webpage works fine when in Incognito Mode, you know that’s the culprit, and you can typically clear Chrome cache and web history to fix the problem completely. If you have a million tabs and Chrome windows open, sometimes the browser can run out of available memory or system resources which can lead to issues loading additional webpages. Sometimes simply closing out of other tabs and windows is sufficient to remedy the “Aw Snap” error. Exit out of Chrome and relaunch the app, this simple task can often lead to the browser working to load a problematic web page just fine again. Updating Chrome to the most recently available version of the browser will often fix crashing problems because each new release of Chrome includes bug fixes and security fixes. Thus, be sure you have Chrome updated to the latest version. You can update the Chrome browser by going to “Preferences”, then to “About” and choosing to update if there is a version available. The browser will download and install the latest version and then relaunch itself, completing the software update. For what it’s worth, if you have Chrome Auto-Update enabled, this likely happens on it’s own and you just need to follow step 4 to quit and relaunch Chrome for the new version to load and be active. Either way, try loading the web page again, it should work now. In my personal experience with Chrome “Aw Snap” error messages, simply updating the browser and restarting the browser remedies the issue almost every time, and it can sometimes fix and prevent other problems too like the “connection not private” error. Third party browser extensions can also cause trouble sometimes, so if you continue to have trouble loading a specific web page, or many webpages get the Aw Snap error, try disabling all third party extensions and plugins to see if the problem still happens. Though it’s rare, sometimes a quirky web page is just problematic, poorly made, or outright crash prone due to an errant script or irrational resource usage. The easiest way to determine if this is the case is to see if the web page loads in another web browser. If the other browser crashes too, then you know it’s almost certainly a problem with the web page itself, and it has nothing to do with Chrome or any other web browser. Ok the last trick for troubleshooting is the oldest in the computer book; reboot. Yes really, sometimes rebooting is all it takes to fix a crashing browser or other app, whether it’s Chrome or another program. Once the computer or device is back up running, open Chrome and browse as usual, all should be in order. Did these tricks work for you to resolve the “Aw Snap” crash error in Google Chrome? Do you have another method to fix the Aw Snap error in Chrome web pages? Let us know in the comments! Just paste in the address of the non opening website and it will tell you if the problem is yours or everyone. Checking if the server is down is good advice but the ‘Aw Snap’ error is due to a webpage crashing rather than not loading due to server error or downtime. For me, and it might be coincidence, but I get the Aw Snap message when I need to update Chrome, so relaunching fixes it. Sounds like the update plugin is broken. Download a fresh copy and replace it, instead of letting it update by itself. 4. Try opening google chrome now !! Hurray !!!! This is OS X Daily. That should give you a clue we don’t have a c: drive…. Thought I was going to get an actual answer, you’ll find LOTS of people with the same problem – from both the Mac and PC side, which just goes to show that sometimes cross-platform software can be problematic on all platforms. i have the same problem and it happens on all browsers i have,and even the home page it cant load.so now my solution,am using the old version of any browser that the one am commenting with now,i know if i update it,it will start aw,snap error. There is no such thing as an “aw snap virus”, you see the message because the Chrome browser window crashed. I would start by reading the article and following the solutions.